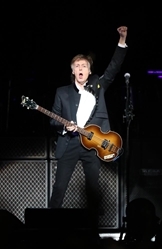 Paul McCartney rocks Sydney with three-hour set packed with Beatles classics and more . Beatles Radio: The Beatles, Solos, Covers, Birthdays, News The Fab 4 and More! LOVE, three chords and the truth are all you need when in the presence of the rock greatness of Paul McCartney. After winning hundreds of thousands of hearts and minds as his One on One tour wound around the country, he finally arrived in Sydney for his two final Australian concerts at Qudos Bank Arena. It was impossible not to marvel that after a very long 23-year wait for the Maccalytes, that here he was, a Beatle for crying out loud. This was the man who managed to transcend the weight of that legend to maintain a profound influence on pop culture for five decades, with Wings, his vast solo work and who most recently shared chart glory with Kanye and Rihanna and the Foo Fighters. McCartney traversed all those chapters in a show which stretched to almost three hours with plenty to sing about love, that perennial pop song obsession. There was his great romantic loves. My Valentine was inspired by and dedicated to his wife Nancy in the audience. And a couple of songs later, Maybe I’m Amazed which he wrote for his late wife Linda got a false start of wrong notes and words before this rock god decided to embrace his fallibility and declare it a trainwreck.